This fully fenced playground is right next to Splash Planet, in fact it shares a fence. Equipment includes a pirate ship for climbing on (reminiscent of the old Fantasyland that used to be where Splash Planet is now). There’s a slide coming down and a wobbly bridge going across to it. 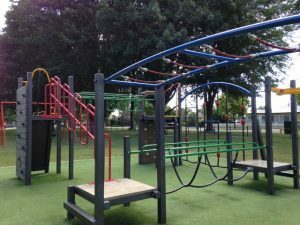 There’s a spacenet and good selection of swings for all ages. 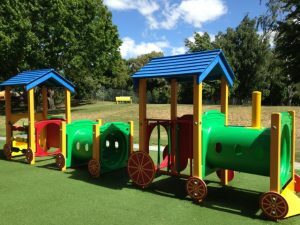 For younger kids there’s also a train made up of tunnels and for older kids there’s a big ‘confidence course’ including various monkey bars and rock climbing walls. The equipment is partially shaded at certain times of the day, by the big old trees that surround this park. Within the fences there are a couple of free BBQs, picnic tables, toilets and a drinking water tap. Outside the fence there’s a huge grassy field which would be great for ball games, kite flying etc. Address: corner of Sylvan Road and Grove Road, Hastings. Free street parking possible on both of these roads.